Attractive payment plans were all the rage at Cityscape Global. Jumeirah Golf Estates was one among the few master developers offering generous post-handover payment plans. For Alandalus, a mid-market apartment project, the master developer is offering a one per cent per month payment plan during construction. This is after you pay a five per cent booking deposit. The offer runs until September 30. The balance 70 per cent will be due on handover in Q3 2019. The payment plan is applicable to the full range of one to four-bedroom apartments, with prices starting from Dh685,000. UAE nationals can also avail of a two per cent waiver on the Dubai Land Department fees on purchasing an Alandalus apartment. “Payment plans are the only things you need to focus on because the market has changed. Our products are meant for people who currently live in rented properties. We have tie-ups with mortgage providers,” says Alya Mahdy, executive director – commercial, Jumeirah Golf Estates. The Alandalus apartments are targeted at young couples with a combined monthly income of Dh30,000. “We are looking at young families. People who have bought villas in JGE previously and now want an apartment closer to their retirement are also opting for Alandalus,” Mahdy adds. The developer has launched around 300 Alandalus apartments so far out of the 715 spread across eight towers. In Alandalus building C with 120 units in total, over 60 per cent has been sold. In terms of construction progress, JGE has touched the sixth floor in buildings A and B and is on schedule for handover in April 2018. Building C will be handed over in 2019. “We have already sold bulk of the inventory in the three towers we have launched,” she adds. “The market is maturing. One is not selling 500 units off the shelf in five seconds. But you can sell a product in the right location at the right price and payment plan. The fundamentals of Dubai remain very strong. Developers have gone through a cycle and learnt their lessons,” the executive observes. The price at Alandalus is Dh950 per sqft. 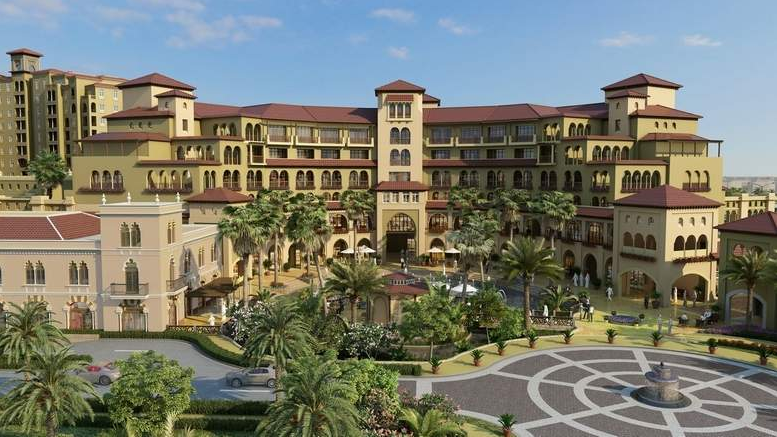 The community will also house a retail centre, hotel and Jumeirah Golf Estates’ second clubhouse. “We have the contractor on board and are talking to an anchor tenant for the retail centre, which is scheduled to open by the end of 2018. The clubhouse and hotel will be delivered along with the rest of the buildings,” she informs. The executive says there were more end-users attending Cityscape this year. “In the previous editions, there were more suppliers, exhibitors and vendors. There were end-users but not as much as you see today,” she concludes.